Multi-Platform Website Display – Why your website MUST respond to multiple displays – Monitors to Mobile! A responsive website that provides multi-platform website display is a must in this day and age. If your website cannot be viewed on a smartphone, your viewers will go to your competitor and a site that is legible. How does YOUR website display on your clients’ mobile devices? Is the content legible? Can you see the images? Do you have to ZOOM in? OR is there a nice flow to your site with images/content that are legible? Nowadays, it is extremely important to have a site that adjusts to various devices. If your website does not have this feature, you may be losing business opportunities. Potential clients will gather information from the site they can read! 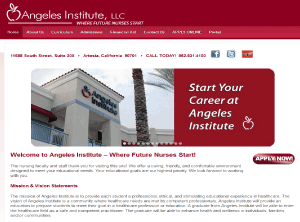 Take a look at the Angeles Institute website particularly on your mobile device. It is responsive to various platforms…laptops, tablets, phones. Now visit your website on your phone…If you need to zoom in to see it, then let’s talk about bringing it up to date!